Looking for the freedom to explore paradise at your own pace? Eager to enjoy the seaside breeze as you cruise along the coast? If so, our inventory of vacation properties that come with golf carts are the perfect fit for you! 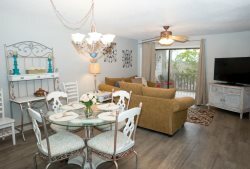 Each of these beautiful units comes with a complimentary golf cart rental to help you delve deeper into the beauty of Destin, FL. Expansive Bay & Golf Course Views From This Tropical 1 Bedroom Condo w/Golf Cart~Beach/Pool Access! Updated Sandestin Home Perfect for Families & Golf Groups w/Golf Cart Includes Beach/Pool access. 8968 Heron Walk at Sandestin ~ 2 Bedroom 2 Bath Luxury Condo ~ Bay Views and GOLF CART! 3 Bdrm/3 Bath Laurel Grove Home w/Golf Cart | Charming Retreat | Perfect for Families! Luxury Vacation Condo at Sandestin Golf and Beach Resort Corner Unit with Water Views! New 4 seater Golf Cart! Comfortable 2 Bedroom 2 Bath Harbour Point Condo at Sandestin Resort ~ Walk to Pool ~ Golf Cart Included! Lake and Bay Views at this 2 Bedroom Sandestin Town home with Golf Cart! 2 Bedroom Bayside Vacation Condo at Sandestin Golf and Beach Resort, Golf Cart Included!